Vaughan and Guerra's beloved comic is finally coming to the small screen. FX made its presentation at the annual TCA meeting, and after decades of fits and starts at looong last, Brian K. Vaughan and Pie Guerra’s Y: The Last Man has been ordered to series. Starring Diane Lane, Barry Keoghan, Imogen Poots, Lashana Lynch, Juliana Canfield, Marin Ireland and Amber Tamblyn, the show will debut in 2020. Show runners will be Michael Green (American Gods, Blade Runner 2049) and Aïda Mashaka Croal (Luke Cage, Turn). Nina Jacobson, Brad Simpson and co-creator Vaughan also exec produced and worked on developing the show. will direct the pilot. The above is the first image released from the show. The show will lose a few words from it’s title howeer; being shortened to Y. 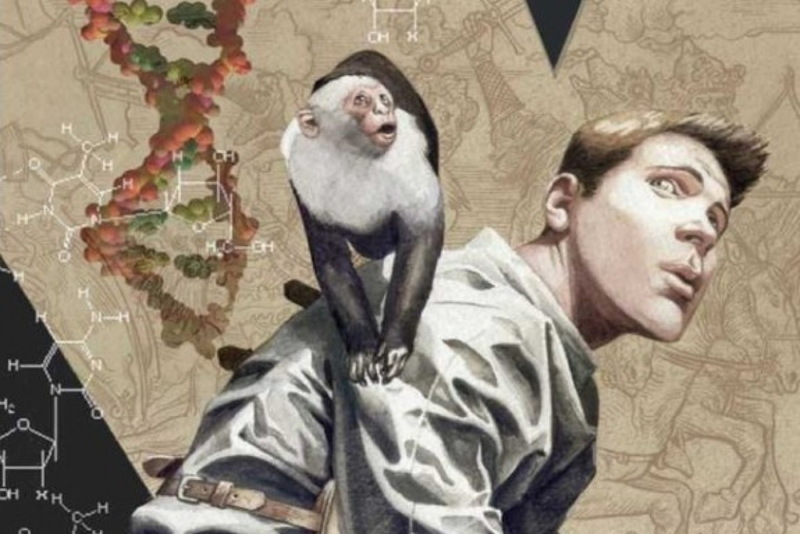 Based on the much loved Vertigo series, Y: The Last Man concerns a world where all the men have died except one man, Yorick Brown (Keoghan), and his monkey. Y: The Last Man has had a long development road, with movies, and TV shows announced just about everywhere over the last 10 years or so. But finally, it is happening. But as one arrives, one leaves. FX also announced that the upcoming Season 3 of Legion would be its last. Creator Noah Hawley had always envisioned Legion as a three-season arc, FX CEO John Landgraf said, and he’s planning to stick to that plan. Legion started out with a bang with possibly the greatest two hours of “superhero” TV ever, but then got really weird and its audience dwindled. Long term prospects were really never that great and Hawley (Fargo) having a vision for a three part story sounds best for all concerned. And Fargo Season 4 goes into production this winter! Still, in the current landscape, its pretty rare for a comic book based TV show to be cancelled, even if a three-year run is considered a good one. Off hand all we can think of is Inhumans, the Netflix Marvel shows and Gotham (which had a five-year run). The CW recently renewed their entire slate of Arrowverse shows. Legion isn’t so much a series that’s getting cancelled as it is an extended miniseries that is ending because it’s the end of the story. Legion is my favourite superhero-adapted TV show. Don’t mind that it’s ending after three seasons, and a catchphrase of mine might read, ‘Legion is dead; Long live Noah Hawley’s next project! (beyond the already mentioned Fargo S4)’.